In the last one month that I have been running social media commercials for the law firm where I worked supported by many Ghanaian Celebrities, I have received hundreds of phone calls and emails—almost everyone looking to relocate from Ghana. The calls are from people who want to relocate with their entire families, students, highly skilled persons and even the unskilled. The emails follow the same pattern. But what has been overwhelming are emails and calls from Ghanaians who have come to study in the UK and want legal means to remain in the UK. When free, I do not only give those who contact us the appropriate Immigration advice and if possible how we can help them within the perimeters of the law—I take time to listen to their stories too. Of course, a lot of these people have no legitimate purposes and documents to be used to make an application for them to come to the UK as they wish. However, it has gotten me thinking: everyone still wants to move out of Ghana—for the fact that things are not getting any better. A lot of bankers who mostly worked for some of the failed banks have called—all asking about how they can come and work in the UK or settle down here with their families. Others confuse our law firm with “connection men” or travel agents’ services and forwardly ask: how much will it cost me for you people take me to the UK. 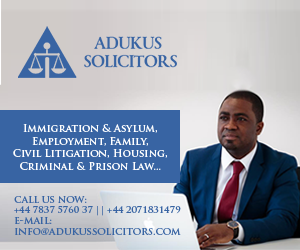 The disappointment in their voices when they hear that we do not do that but we are a law firm that provides legal representation, guidance and advice to qualifying persons looking to travel to the UK or already in the UK cannot be missed. Others say: l have this amount of money, I want to pay you and then you get me a visa—to which we reply, it does not work that way. Many years ago when I was young and was finding my way around the news, the word “Brain Drain” was ubiquitous in Ghana—today the exodus continues and this time, it’s not only skilled or professional persons, even the unskilled are looking for a way out of Ghana. Ghana is still almost hopeless, perhaps, even worse. Just this week, I have given Immigration advice to several young Ghanaian men and women who have come to the UK on a student visa and want to join the Army—returning to Ghana after their studies is no more an option for them. Shockingly, the political rhetorics in Ghana do not seem to tow a line of a country deep down the hole—the politicians claim the country is doing well but every other indicator shows that the living condition of the people is not getting well. READ ALSO: What About Elves Giving You That Multiple ORG*SM? No condition is permanent: it gets worse before it gets better some people say. But in Ghana, things seem to be retrogressing—the frustration is growing stronger and there is no sign of light at the end of the tunnel. It’s different if there is some sort of hope hovering around, where Ghanaians will endure the pains of today and honestly believe it will get better tomorrow. For now, there isn’t any hope anywhere—it’s bad for all, especially young graduates. In recent times, I have found myself arguing that we have become useless as people and this is evident in the sort of leaders we even elect. I believe the new Ghanaian, the young folks need to take back power—how a country of young people is always led by people who are so old that they would have had to retire even if they were teachers remain a mystery. Our leaders seem to have no sense of direction: their priorities are heavily misplaced and we are facing the obvious consequence. Not just Ghana, Africa in general needs to wake up—and we first have to get rid of the old grandfather presidents and state ministers leading us to the grave. We need to hold on to a new font, evaluate the discourse and inject contemporary perspective into the conversation. It’s sad but that’s the whole truth, nothing but the truth! The youth has really no space in politics in Ghana. They’re only called during election period to intimidate their colleagues and other weaklings in the society. Ghana isn’t that worse as being projected neither is it better as being touted by some so called “indicators”. The problem is the expectations of Ghanaians from the current government. We’d hoped to see miracles immediately after election but sadly, we face same challenges. Ghanaians give up too quickly and give in so easily.